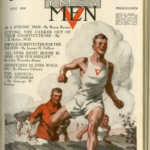 The YMCA has a long and very interesting history. Some of our curr ent holidays, sports and organizations began with the Y.
June 28, 1864 President Lincoln signs the Congressional charter of the YMCA of Washington, D.C.
YMCA of Central New Mexico opens 1915 in downtown Albuquerque. President Ronald Reagan was a YMCA-trained lifeguard in Dixon, IL and is credited with saving 77 lives in Rock River. He also played in the YMCA’s band. 1989: YMCA Earth Service Corps start in Seattle. 2007: Grand opening of the H.B. and Lucille Horn Family YMCA. 2010: McLeod Family YMCA remodel is completed.